SKY MAP: The sky as seen at 10 pm local time on June 8 from mid-northern latitudes. Two star patterns that can be found crossing the meridian soon after darkness falls on these late spring evenings are Bootes the Herdsman and Virgo the Maiden. Arcturus and Spica, the brightest stars in these two constellations, form a large, nearly perfect equilateral triangle the star Denebola in the tail of Leo, the Lion. George Lovi (1939-1993), who for many years penned the "Ramblings" column of Sky & Telescope magazine, called this pattern the "Spring Triangle," perhaps by analogy with the more famous Summer Triangle (made up of the stars Vega, Altair and Deneb). However in the book "A Primer for Star-Gazers," Henry Neely (1879-1963) described Arcturus, Spica and Denebola as the "Virgo Triangle." In either case, it's an easy pattern to identify in our current evening sky, both for stargazing novices and for navigators. Unlike the Summer Triangle, however, the Spring (or Virgo) Triangle is nowhere near the Milky Way. However, the Spring Triangle does overlap a vast number of other milky ways. Just to the east of Denebola is a region that many skywatching guides and astronomy texts often refer to as the "Realm of the Galaxies." It is here that you will find a veritable treasure trove of numerous star cities. Thousands of galaxies have been photographed here with great observatory instruments. If you own a good reflecting telescope of at least 6-inch aperture or greater, a sweep of this region will reveal dozens of these galaxies appearing as a myriad of faint and fuzzy patches of light. This is the only great cloud of galaxies that is available to the average amateur; just try to remember that each and every one of these dim blobs is a star city, which likely contains tens of billions of stars! And keep in mind that this cluster or cloud of galaxies is the nearest of the large aggregations of galaxies relative to our own. The best estimates indicate that it is located somewhere between 40 million and 70 million light-years from us. So it is possible that as you run across these pale little patches of light in your telescope, most of which appear round, elongated or irregularly shaped, that you are gazing upon galaxies whose light may have started toward the Earth around the time of the extinction of the dinosaurs. 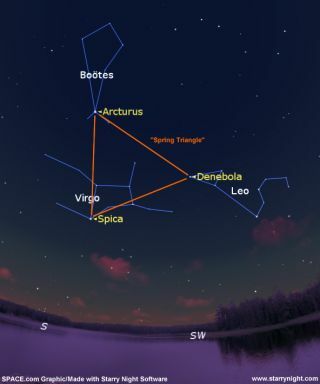 Of the two constellations that supply the two brightest stars of the Spring Triangle, Virgo may not be easy for some beginners to trace out, but it does have 1st-magnitude Spica as a convenient starting point. Much fainter stars located above and to the west of Spica form a Y-shaped pattern which at one time was called "The Retreat of the Howling Dog." This probably referred to one of the Hunting Dogs of the constellation Canes Venatici, located farther north. To American stargazers, Bootes is the Herdsman or the Bear Driver, an allusion to the way he follows Ursa Major around the sky. To the British he is the Ploughman, since he follows the Plough (better known to Americans as the Big Dipper) in the sky. Bootes brightest star, the orange Arcturus, holds the distinction of being not only the brightest star in the Spring Triangle, but the fourth brightest in the night sky. Many pronounce the Herdsman's name incorrectly as Boo-teez, instead of the way it should be, Bo-oh-teez. In fact many of the older star guides place an umlaut over the second o (Bo?tes) to prevent this mispronunciation. ??? Most astronomy guides refer to Bootes as resembling a longish kite. To me, however, he looks a lot more convincing as an ice cream cone. In fact, immediately to the left of the cone is the semi-circle of stars representing the Northern Crown (Corona Borealis.) At New York's Hayden Planetarium, I'll point out the Crown to audiences as a second scoop that slid off the top of the cone. As to what flavor concoction is in the cone, that's easy. Someone bit off the bottom of the cone where a glob is poking out. Since that's where Arcturus is, the flavor is obvious: orange sherbet! ?